October 26th 2008 ~ Bonsai's 13th Birthday ! 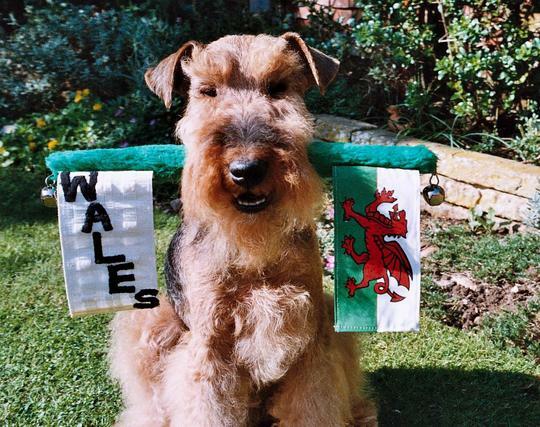 My Welsh Terrier, Bonsai ~ pictured with his Welsh flags, which were part of his tricks routine. Bonsai's birthday present was the toy mower you can see on a previous photo. He was clever having a birthday on the day the clocks went back. A whole extra hour of birthday. Whoopee ! Some of the comments below were made prior to 21st November 2008, when Bonsai went to doggie heaven. Bonsai appreciates your good wishes. He's relaxing at the moment. As always, with the clocks going back, he is ready for food an hour early. Was looking for his "ten o'clock treats" at 9 a.m. ! And could I refuse him ? aww happy 13th birthday Bonsai. I hope he enjoys his birthday and glad he has a good appetite. Bonsai has just had a visitor, bringing him a card and present! Awww he,s such a lovely dog TT. I hope he's feeling better soon, is it just his age or something else.. Sadly Bonsai was recently diagnosed with liver cancer, but he is on supplements which are giving more strength, so he has a good quality of life. Yes, the vets can do lots more than they could years ago. Beautiful Bonsai...But where is the birthday hat? Glad to hear he is doing his tricks. Sounds like it made his day. Pass along birthday xoxoxs from Chummy and Scrunchion, and me! PS-we would like to see a family pic with you included sometime???? Bonsai is having his siesta. He's really enjoying his day, so it'll be one I can remember with pleasure. With any photos I'm behind the camera. Both dogs have just had a grooming session. Lots of treats and goodies. That's a great photo. Henry and I are glad he had a happy day and wish him more of them. Thank you Spritz and Henry. I thought the GoY members in Wales might especially like the Welsh flags! Happy Birthday Bonsai! Hope you like your toy mower! Welsh terriers are such characters, he's a beautiful dog, happy birthday Bonsai! Dawnsaunt ~ Yes thankyou. Bonsai had a lovely birthday. Mowed up and down the lounge. Yes, I've owned several Welsh Terriers. Each dog full of energy, intelligence and personality, but not aggressive. handsome chap hope he was well enough for extra treats on his birthday. oh oh happy belated b'day to Bonsai!!!!! Bonsai seems stronger this week. He says thanks for your message. Happy Birthday Bonsai - sorry I'm late! October 26th is also my husband's birthday so from now on I will also be thinking of Bonsai on that day. Thanks. Happy birthday to hubby too. You win the award for changing your avatar picture the most times. I think Jacque is a close runner-up. Lol. You look younger in each picture. I like variety! I thought "Chillin' with my gnomies" was quite appropriate in this weather! Bring your gnomes and come curl up with Bonsai. He's been snoozing all morning by the radiator wrapped up in blankets. That's just what I would love to do! Unfortunately still have to do the festivating of the house for Halloween and a lot of less exciting stuff today. Give him a hug from me. Our Dogs mean so much to us, I hope they know how much. Bonsai says thank you. He enjoyed his hug from you and says hello to Nelly. He has another check-up at the vet next Wednesday. He is SUCH a cutie pie ! Give him a cuddle from me please. Sewingkilla, Toffee, Jenn and family and all the cats in New Zealand. Due to your 'likes' he is currently waving his Welsh flags in the top four photos, so thank you. Sorry I missed your birthday Bonsai. Hope he's not feeling too bad TT - he's in good hands with Conker and Crocus. Bonsai seems to be doing well today thank you. Birthday wishes dear Bonsai hope he is in not too much Pain terratoonie. A happy belated 13th birthday to Bonsai from Finn! We senior citizen doggies are doing very well. We've lasted from one century into the next. you are doing very well. You have uploaded photos, made comments, sent private messages, answered comments under your own photos. You are not daft at all. You've done extremely well. I hope to see more photos of the birds in your aviary and the flowers around your aviary. No wonder it is your pride and joy. Private message me again if you have more questions about GoY. I will send you a message on Sunday to explain. Don't worry we'll sort it out. What an adorable photo! Your pooch is very well-trained. Anyone reading this, please take a look at Donna's photos. She has a beautiful garden and aviary and pets. And she has worked very hard this week to understand GoY. Bonsai, my Welsh Terrier, had his check-up this afternoon. My thanks to the many GoY members who have asked about him. My main concern was his bloated stomach. The vet said the cancer has grown, but most of the swelling is probably due to fluid retention, and Bonsai is not in any pain. The vet was generally pleased with him and is therefore delaying repeat booster injections re. the bone marrow etc. and wishes to see Bonsai again in three weeks, unless there is a sudden deterioration. Glad to hear that news TT. I was thinking about you this afternoon. Great news TT, enjoy all the time you can with your special little fellow. I'm so relieved and pleased for you TT and Bonsai - it's makes all the difference when we are reasssured that our little friends are not in any pain as it's makes you want to cry with helplessness when they are. I am so very grateful for all your comments of support. They are more help than I can explain. Thank you. I'm giving Bonsai lots of reasons to want to keep going. His digestive system is coping better with 'little and often' so that means smaller meals, but lots of nice treats in between times. Bonsai is still having fun with his tricks practice each day. Those ten minutes he really comes to life. Watch him play the drums or wave his Welsh flags! Gillian ~ I'm glad news is better for you at the moment ~ keep digging for victory ! ~ and thanks for your wishes. Terry60 ~ Yes, I'm reassured that Bonsai is not in pain. The magic medicine is a glass bottle of tonic supplement which contains iron, vitamins B6 and B12, folic acid and sorbitol. It is a clear green liquid, palatable, and you put a teaspoonful on food. Called Vi-Sorbin. When I looked it up on the internet, apparently most often used (in bigger doses) for horses and foals. Definitely a way to put some instant strength, goodness and energy back into the body. I've looked up some details about doses for cats and will private message you with those. It's wonderful that you try to help the strays. Great news for you and Bonsai, keep it up Bonsai!!!! Bonsai says thank you for your support. I've just noticed that somehow Bonsai didn't thank Lucky for the birthday wishes he sent. Sounds like LUCKY is the right name for your pup ! Pleased to hear Bonsai is doing OK, TT. Good news for both of you. Thank you. His sight is now almost gone, but he's still enjoying life. My Chocolate Labrador enjoyed life for several months after she was diagnosed with a brain/ear tumour 2 years ago. She was 13. They are amazing and just keep going. I cannot imagine life without a furry friend around! and I have feathered friend too with the budgie ! Good to know your Chocolate Labrador coped well for a while with her tumour. I searched your photos but I can't find her. Is there a picture please ? Well done vet, well done TT and keep going Bonsai! I gave Bonsai a bit more of a "haircut" this afternoon. I'm doing a little each day so as not to tire him. Just in from potting up more plants, having a cuppa and looking for a photo of Lily to post for you TT. I'll keep a look out. Got the bug...gone a bit mad with them! Found picture, don't have many on laptop as didn't have a digital camera for long before I lost her. Also found one of some of the feathered friends I used to have when I had an aviary. Used to have chickens too, but no digital pictures! The butterfly picture I uploaded recently, is just an old photo which I scanned onto my computer. It turned out clearer than I had expected. Maybe you could scan some of your photos, or if you don't have a scanner, ask a friend to do it for you, and email the pictures to your computer. Hi TT I have just been catching up with all the news about Bonsai, I am really sad that he is so poorly can only imagine how you must be feeling, he looks and sounds such a wonderful dog, it is good to hear that he is responding to his treatment and that he is not in pain, I pray that he continues to repond. All the wonderful support and comforting words you have recieved from all your GOY friends is fantastic and shows what caring people they are. Yes, the support of the GoY members is a big help. I'm making the most of every bonus day with Bonsai. You have a young pup happily at the start of her life and I have a dog sadly towards the end of his time. There's that old saying again : The only thing wrong with our pets is that their lives are too short. I'm treasuring every moment I have with Bonsai. I was worried about Bonsai on Sunday. He is normally a slim dog but his tummy became huge and bloated like a beached whale. Apparently fluid build-up due to the liver cancer. Thinking of you and Bonsai. He really couldn't be more loved or well cared for. Bonsai says thanks for the ear rub. I gave him the name Bonsai because with a Welsh Terrier you are forever having to trim bits off the coat to keep it looking neat and tidy !!! Hello Islander. Nice to see you back on GoY. I know you've been working long hours. Thanks for your kind messages across the ocean. He is just tucked up ready for bedtime so I'll give him that extra hug. Bonsai is a very lucky dog to have you for his friend, you know all his favorite things. It was a pleasure to bath Bonsai the other day - a thing we've always enjoyed together and a way I can make him feel a bit better. I feel helpless and wish there were more ways I could improve his health. Hello TT and Bonsai.......Finn and me send him a lot of love as he is not too well and Finn assures me he will be very happy and content being round his best friend in the world and as it will be his 11th birthday tomorrow, he will be thinking of him when he has his doggie party. Happy 11th birthday Finn for tomorrow. Maybe you'll get the chance to upload a birthday photo. Bonio cakes and squeaky toy presents ? I hope you all have a wonderful time. It's just a photo of the cake. Happy birthday Finn!...better eat your cake before Sid & Terra get to it...! When is Flash's birthday ? Bonsai went to doggie heaven on 21st November 2008. I've put Bonsai's Welsh flags away for the time being. I think every one on Goy will miss him Terra. His pictures have been a delight to us all. I'm sorry to see this sad news TT, Bonsai had a wonderful life with you, and he will live on in your memories. Thanks for your comments and kind thoughts. TT, This is fantastic! I die laughing when I see your doggies doing tricks...they are just SO cute...my 2 just lay on the couch all day and bark when it strikes their fancy!!! I'm so very sorry to hear about your Dusty. Each pet is so very special, and yes, I'm sure Dusty and Bonsai are enjoying the gardens of heaven together. An old neighbour used to have one that would only bark at visitors when they tried to leave after visiting ! I can imagine your neighbour's dog barking.. but only to prevent visitors from leaving ! Lol.